"Hello, my name is Erin, and my parents are divorced." Sometimes, I feel like I'm a member of a club that I can't get out of, even if I fail to pay my dues. It's the Adult Child of Divorce Club, and there are times when being a member is no picnic. Much effort is often made to console and comfort children whose parents are divorcing (and rightfully so). But when we become adults, no one seems to want to talk about it anymore. It's entirely possible that if you're a child of divorce, you start to feel the familiar pangs of sadness, anger, resentment, and loss resulting right about the time you flip your calendar from October to November. That's because the holidays can usher in a season of angst while we try to navigate celebrations at multiple households, interact with parents and step-parents, and face painful memories of past holidays. Divorce leaves such a painful scar on our hearts that we may need to forgive our parents (or their significant others) many times. While my husband sees six (yes, six!) holiday dinners as nothing more than a chance to chow down, I see it as a huge reminder that my parents and my grandparents are divorced. All those turkeys just represent failed marriages to me. Don't get me wrong—it has been twenty-one years since my parents divorced, and by God's grace, I am fully healed of the resulting pain. But I still have to navigate my complicated family situation every year for the holidays. If you're in the Adult Child of Divorce Club, you have to deal with similar issues. 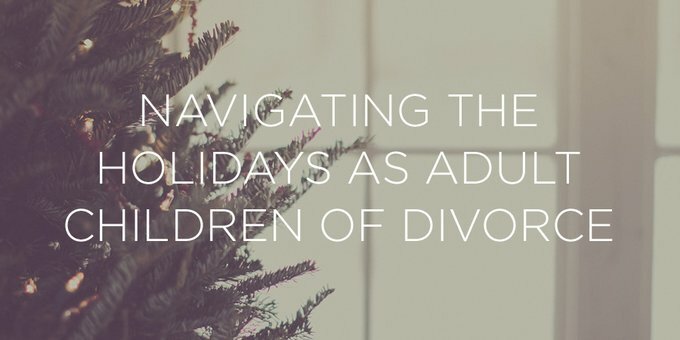 I'd like to start an open dialogue about how, as children of divorce, we can avoid potential land mines and thrive in this season. Believe me, I haven't got this all figured out, but after twenty-one holiday seasons with divorced parents, God has taught me a lesson or two. Such as . . .
God's Word gives us clear commands to forgive. We tend to think of forgiveness like a dot on a map. Yes, I visited "Forgiveness" once. I checked that off my to-do list. But, it's not always that simple. Divorce leaves such a painful scar on our hearts that we may need to forgive our parents (or their significant others) many times. Does the impact of your parent's divorce on your holidays make you feel angry, hurt, bitter, or resentful all over again? Let those emotions serve as a reminder to forgive, not because your parents deserve it, but because Jesus commanded you to, and because He has forgiven you! My parents have been divorced more than two decades. Each of them is happily re-married. But, they still have many important things in common: mainly me, my siblings, my children, and my siblings' children. That's why I've suggested having some holiday celebrations together as one BIG, happy family. Not every family could do that, but I do what's in my power to make being together feel natural by treating everyone equally. Whether you get everyone together in the same room or not, how can you foster family unity this holiday season? Sometimes more pain is caused by what isn't said than by what is. Refusing to ever talk about the divorce again won't make it less painful. We had trouble working out our Thanksgiving plans this year because there were multiple houses to go to on the same day and I didn't want to stretch my small children (or myself) too thin. Instead of forcing arrangements that would have added to stress or sweeping the challenges under the rug, I simply called both sets of parents and said something like, "I'd rather not go to both houses on the same day. We end up not enjoying the holiday because we are so rushed. I want to be a blessing to you. How can we work together to fix this?" We came up with an arrangement that worked for everyone and we were all better off because we talked about the challenges of our blended families openly and with a goal to love each other well. As grown children of divorce, the odds are stacked against us. But we have tremendous hope in God's power to transform our circumstances for His glory—your parents may be divorced, but that doesn't define you. That is not your legacy. Use the holiday season as a reminder of God's ability to heal, transform, and restore. And then ask Him to strengthen your own marriage, friendships, and overall mental health in the days and weeks to come. I now call the meeting for the Adult Child of Divorce Club to order. Today's topic: making the holidays sweeter. What do you do to navigate this time of year with grace, even with your family's "interesting" dynamics? This post was originally posted on the True Woman blog on November 16, 2011. We've refreshed the content in order to allow it to continue to encourage and help you as you seek to serve God and others. Next Post Do You Obey Jesus Out of Love?